Whilst Daoism advocates letting nature take its course, the Daoist religion, on the other hand, advocates becoming an immortal through reversion (ni xiu). From the perspective of natural creation, reversion seems to be an act against nature. However, hidden in between Heaven and Earth is the profound mystery of creation resulting from the constructive interaction of “being” and “non-being”, whether it is from “being” to “non-being”, or from “non-being” to “being”, the creation of all beings should have been a path to mystically profound communion with nature. Although the self-cultivation of Man can be said to be a retrograde act, but such act is only for reverting to nature, to the position of mystical profoundness. Becoming an immortal is a process through which Man, as defined by such mystically profound position, allows his Yang spirit (Yang shen) to constantly elevate and manifest its capability. A divine immortal is the infinite expansion of the Yang spirit (Yang shen) as defined by such mystically profound position. Key words: Lao Zi, Nature, Mystical Profoundness, Inner Alchemy, Self-cultivation. Daoism advocates “the Dao emulates nature”, the general meaning of which is to let nature take its course, which is the essence of Daoism and is also the core value of Daoism.Contrarily, the self-cultivation of the Daoists has over time taken the path of reversion, with the objective of becoming an immortal. The realm of the divine immortals to Man is another mode of existence besides the human race, therefore, becoming an immortal can be easily deemed as an artificial and not natural evolution. The Daoist scriptures also advocate “one’s life in one’s own hand and not in the hands of Gods” , based on which, Man should enjoy his inborn primordial life and can exhaust his natural years, living till the age of 120, but reversion through taking “one’s life in one’s own hand” may outlive human life and last as long as Heaven and Earth. Various phenomena emerging from becoming an immortal through reversion easily create the false impression that the acts of self-cultivation for becoming an immortal through reversion are against nature. In fact, it is not the case. Becoming an immortal through reversion and “the Dao emulates nature” are basically the same. “The Dao emulates nature” comes from Lao Zi: “Man emulates the Earth, the Earth emulates the Heaven, the Heaven emulates the Dao, the Dao emulates nature.” Lao Zi originally deemed that all beings existing in between Heaven and Earth exist according to the laws of Dao, all have to follow the law of nature, which is Dao; and Man is a being in the phenomenal realm, and the existence of Man was originally attributed to nature, and therefore Man has to emulate nature. The reason why Lao Zi put forward such subject was that he deemed the existence of Man already unnatural and that Man had to return to a natural condition in order to follow the Dao. Lao Zi referred to acts that are unnatural as “assertive”, which is relative to “non-assertive”. In between Heaven and Earth, only Man has the ability to do things that are unnatural, and hence “being assertive” directly refers to the acts of Man. This is the reason why Man is departing from nature. Any thing that is assertive is likely to be unnatural. Since Man has desires, therefore Man has to act. Originally, the desires of Man with respect to the coexistence of Man and this world were not a defect, which may or may not be necessary. “All beings steal from Heaven and Earth; Man steals from all beings; all beings steal from Man”, it is only natural for all beings to steal from each other and to inhibit each other. Such nature is the dynamic equilibrium of the phenomenal realm. In Lao Zi’s thinking, the expression “having desire” is also not derogatory. The civilization of mankind is a good consequence of nothing but Man’s inborn basic instinct of having desires. Lao Zi deemed that, Man’s “having desire” (you yu) has to balance relatively with “no desire” (wu yu) in order to maintain the mystically profound development of the natural realm. Only this way, the operation of human desires will not become a problem. However, Man, for the sake of his own existence, ruins the equilibrium in the natural realm when exercising his right of having desires, and as a result of which, problems emerge. This is the reason why the “assertive” acts of mankind will create crises that are no longer natural. If mankind applies “having desires” in a suitable way, appreciating what they have and knowing when to stop, then the position of mankind in the natural realm is still “mystically profound”. “Mystical profoundness” is non-assertive, and is natural. Lao Zi put such “having desires in a suitable way” in a “mystically profound” position which mutually counters against “having no desire”, and hence the saying: “constantly without desire in order to observe its wonder, constantly having desire in order to observe its limitation”. If Man departs from nature, he must go back to nature (see the attached “Reversion Diagram 1”), therefore, Lao Zi told us to emulate nature: “Man emulates the Earth, the Earth emulates the Heaven, the Heaven emulates the Dao, and the Dao emulates nature.” If Man can do this, the Way of Man is natural, then all beings are as “one”, and all being mystically profound. What Lao Zi wanted to criticize was not “having desires” itself, which is inborn in mankind, but the state of excessive desires. Today, the extreme “having desires” of mankind is being manifested in damages inflicted to nature, for instance, global warming, deforestation, rivers changing their course, dramatic increase in the varieties of viruses, mad cow disease, foot and mouth disease, avian flu, swine flu, etc. etc. From the perspective of this mystically profound world, if Man wants to revert from “having excessive desires” to “having suitable desires”, then Man must practice “reversion” (ni xiu). “Reversion” means allowing a Man who has departed from nature to revert to a Man who originally came from nature. Lao Zi called such condition “reverting to an infant”. That is because, only Man in his infant state is closest to nature. As an infant matures, it will have more and more human desires, or even desires exceeding its own role, which is departing farther away from “mystical profoundness”. The fruits of human civilization are all the effects of “having desires”, but if the cost of civilization means destroying nature, then it is not mystically profound. Daoism advocates reversion from the stand point of reverting to nature, the true nature of which is an act totally “emulating nature”. Man reverts to his “mystically profound” position simply because of reversion, and only then Man is qualified to further experience “the Dao emulates nature”. Self-cultivation for re-establishing the mystically profound position is one of the focal points of reversion; however, by referring to it as reversion, we may as well say it is self-cultivation practice for reverting to true nature. From the perspective of reverting to true nature, we may affirm the matter of reversion through Chen Tuan’s “Wuji (Non-polarity) Diagram” (Wuji Tu) that such matter is an act that is absolutely natural. Chen Tuan’s “Wuji Diagram” (Wuji Tu) mainly introduced the way for becoming an immortal through reversion. Later, Zhou Dunyi borrowed the idea of such “Wuji Diagram” (Wuji Tu) to create separately the “Taiji Diagram” (Taiji Tu) and the “Illustration of the Taiji Diagram” (Taiji Tu Shuo), using the prograde act interpretation that prograde is the way for becoming a Man to establish the canon for Confucianism, and affirming that loyalty, righteousness, humanity and justice are all inherent in mankind. Switching from the “Wuji Diagram” (Wuji Tu) to the “Taiji Diagram” (Taiji Tu), apart from the layouts of such diagrams, which are being interpreted differently from the prograde and retrograde directions, the details of such diagrams have not been changed at all. 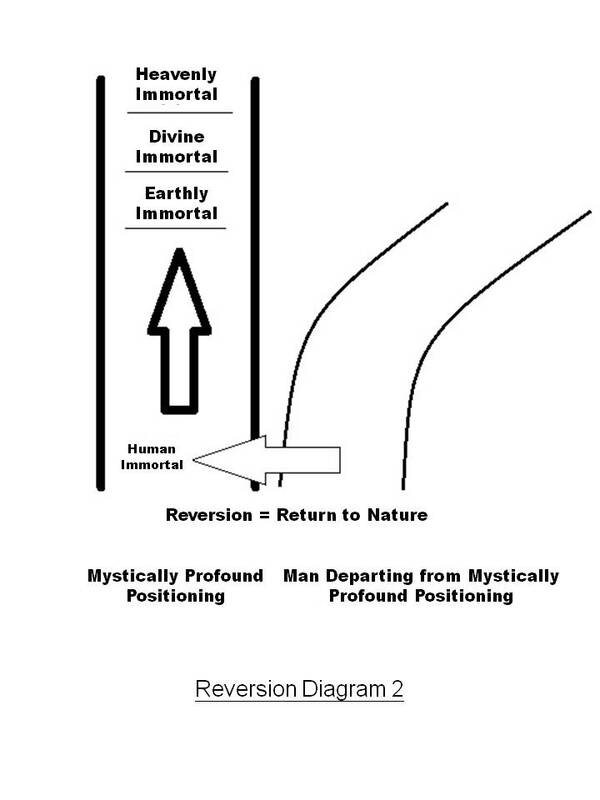 From such diagrams, we are able to understand that becoming an immortal through reversion and natural lifespan follow the same path, and the path of reversion is not a detour especially developed from the path of natural lifespan. 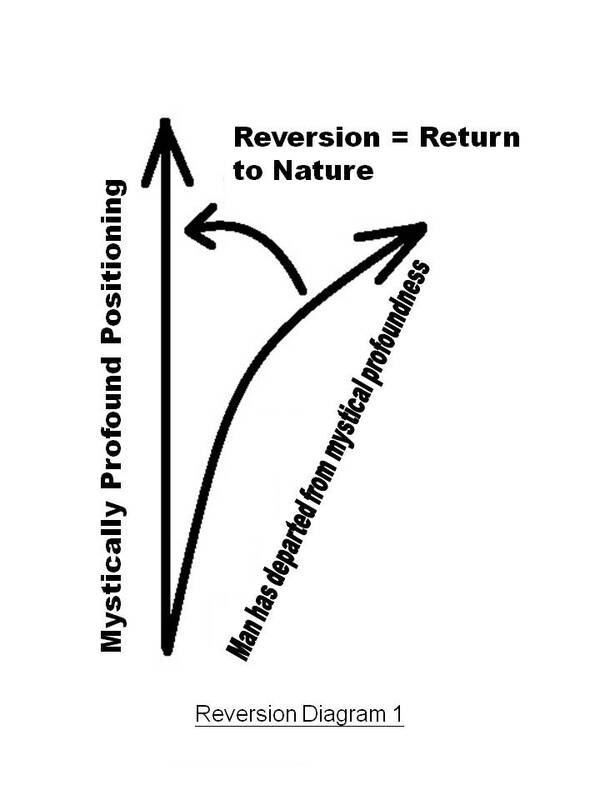 The reversion being referred to in such diagram is only a path of return in natural evolution. Man, as one of the thousands of beings, finally reaches the re-integration of mind and body through the inner alchemy practice of “taking Kan to fill Li” and reverts to an infant, back to his true nature and original form, and into a true communion with the Dao by reverting to voidness through cultivating his spirit (shen). Chen Tuan’s “Wuji Diagram” (Wuji Tu) tells us, the extremity of self-cultivation is “wu ji”. Becoming an immortal is only a reference in terms of evolution for excelling the realm of “wu ji”. Lao Zi did not mention the physical being of a divine immortal. But it was mentioned in Zhuang Zi: “Far away on Mount Gu Ye there lived a fairy whose skin was fair as snow and whose manners were like a virgin; who did not eat any grains, but lived on natural elements; who glided with the clouds and harnessed the flying dragon, rambling beyond the four seas. By concentrating her spirit, she saved things from diseases and secure a year’s harvest.”  Such kind of “fairy” with a human personality has always been deemed as having supernatural powers, like not being burned by fire, not getting drowned in water, not being hurt by daggers nor arrows, not feeling cold in winter, not sweating in the summer sun, etc. Up till the Five Dynasties, the concept of a divine immortal under the “five classes of immortals” created by Zhong-Lü Inner Alchemy is manifested in the form of the Yang spirit (Yang shen). The divine immortal as described by Chen Tuan, Zhongli Quan and Lü Dongbin is completely a manifestation of certain kind of capability, which is the superior energy for migrating from “being” to “non-being” expressed in name of the capability of the Yang spirit (Yang shen). The path for becoming an immortal through reversion is perfected under the hierarchy of the spiritual and physical practice of inner alchemy. Two prerequisites must be satisfied for becoming an immortal. One is the cultivation of the mind, that is, the techniques for spiritual cultivation. The other is the cultivation of the body, that is, the techniques for transforming the physical body. Mystically profound positioning is in a three-dimensional form, which has to be opened crosswise. The cultivation of the body is vertical, reverting from the physical body to an infant. The cultivation of the mind is horizontal, remaining pure despite emerging from impurity. Spiritual cultivation is moral behavior in practice. Man is different from shingles or stones, mainly because Man has desires. Thousands of years of Chinese self-cultivation have never departed from the elevation of morals and virtues. Confucianism emphasizes on the moral practice of human relationships. Humanity and justice come from the heart, and if an act is done with the ease of mind and guided by conscience, it should not be immoral. Daoism emphasizes on true nature, like an infant who has not grown into a child, so long as it is reverting to an infant, it is in unison with the Dao. However, human nature may be smitten by Man’s own desires, once the heart has desires, then the true character is concealed, and greed, hatred and ignorance follow like one’s own shadow. Since the three poisons are not eliminated, Man has to cultivate himself, letting his own mind to become pure and clear again. Such cultivation is generally in terms of reversion. Strictly speaking, this should not be regarded as reversion because it was not like this originally. Originally, it was pure and clear, which later became impure, and to remove such impurity and become pure and clear again is, on the whole, a kind of reversed process, and not reversion. To put it in a reluctant way, such self-cultivation is reversed relative to the three poisons. If we say that the cultivation of the mind is an act of reversion, we may as well say that such rehabilitation of moral and mind is the re-emergence of true nature, which was like this originally and should be like this again, that is, only an act according to the celestial order. The cultivation of the physical body is the positive reinforcement of the physical body in reality, thereby improving such physical body or even excelling the quality of an immortal body. The degeneration of our bodies has much to do with the over exertion of the essence (jing), natural energy (qi) and spirit (shen). Man’s inborn primordial life should have been 120 years. Let’s look at it from the perspective of Chinese medicine, people in ancient times remained active even when they were one hundred years old because they “followed the laws of Yin and Yang, complied with divination, adopted a regular diet, led a disciplined life, never over-exerted themselves, and therefore their body and mind remained active, and they could exhaust their natural years, passing away after spending a life of one hundred years.” As for “modern man”, they fail to exhaust their natural years because they fail to learn the Way of Heaven, and they act without reservation, the cause of which being “they drink as if it were nectar, they act ruthlessly as if it were normal, they get drunk before going to bed, wanting to completely drain their essence (jing) and waste their vital energy (zhen qi), they do not know limitations, resting at the wrong hours, only wanting to please their hearts, but against the making of true happiness, they live without reservation, and therefore they become weak at the age of fifty.” The cause for short life is mainly due to the over-exertion of spirit (jing shen) and vital energy (zhen qi) brought about by acquired excessive desires. If we look again at the cultivation of the body in the spiritual and physical practice of inner alchemy, the Hinayana (xiao cheng) inner alchemy method is completed with the harvesting of vital energy (zhen qi) after building the foundation in one hundred days, the whole cultivation is inclined towards the perfection of exhausting the natural years and the maintenance of physical condition. The “elixir” (dan) refined from the harvesting techniques is also called “vital energy” (zhen qi), the true nature of which is the same as the primal energy (yuan qi) that comes with inborn primordial life, only that it is acquired from self-cultivation. The Hinayana (xiao cheng) hierarchy for “reversion” from a sick and depleting acquired life to a healthy and comfortable extended life is also a process of self-cultivation for returning to the original primordial life. That is to say, it is not quite correct to refer to such kind of self-cultivation as reversion. To put it more aptly, the Hinayana inner alchemy is a project for letting the physical body to return to its natural condition. Therefore, like the cultivation of the mind, we too have to adjust our concept with respect to the cultivation of the body, which should only be for the cultivation of a sick physical body so that it will regain its healthy and natural true nature. Lao Zi’s school of thinking does not directly discuss the prograde and retrograde issues in self-cultivation. What he pointed out was the polarity of things. Life and death, being and non-being, all have the dynamic model for constructive interaction. Constructive interaction is the unchanged Dao. It is because of the “constructive interaction of being and non-being”, there derives the prograde and retrograde concepts, but such concepts are not the original intentions of Lao Zi. From “non-being” to “being” is prograde, whereas from “being” to “non-being” is retrograde, which are taken up in the “Wuji Diagram” (Wuji Tu) and the “Taiji Diagram” (Taiji Tu), although the two names are different, but their substances are exactly the same. Lao Zi’s “the Dao evolves into one, one into two, two into three, three into all beings”obviously is an illustration of prograde evolution, but it is only for the sake of illustration of the prograde way; we must bear in mind that, Lao Zi also mentioned the “constructive interaction of being and non-being”, the prograde way also implies the feasibility of the retrograde way. Zhou Dunyi understood this very well. Although that is the retrograde way, we cannot interpret self-cultivation as against nature. Nature encompasses the capability for creation and degeneration, there is creation as well as degeneration. The “forms” emerging in the phenomenal realm are forms that are interchanging in a parallel way. The constructive interaction of being and non-being is “constant”, creation is prograde, whereas degeneration is retrograde. Such prograde and retrograde ways move in different directions along the same natural orbit. No matter towards which direction things develop, it is naturally a part of the law of nature. The Madhyimayana (zhong cheng) and Mahayana (shang cheng) techniques referred to in the spiritual and physical practice of inner alchemy mainly focus on the discussion of the capabilities of the Yang spirit (Yang shen). The practice of the Hinayana (xiao cheng) techniques in inner alchemy is aimed at becoming a human immortal (ren xian), with a comfortable extended life. If a human immortal is a kind of re-transformation back to the true nature of natural life, and there is still room for further evolution along the mystically profound orbit, then the elevation of the capabilities of the Yang spirit (Yang shen) through the Madhyimayana (zhong cheng) and Mahayana (shang cheng) techniques in inner alchemy is just an infinite extension along such path of mystical profoundness. That is to say, the realms of the divine immortals reached through reversion, irrespective of whether such realm is for earthly immortals, divine immortals or heavenly immortals, are on the same cord of mystical profoundness but at different locations. Mystical profoundness is the critical boundary for “being” and “non-being”. From “being” to “non-being” is a transition from the zone of “being” towards the zone of “non-being”, and the critical boundary reached is a mystically profound and indistinct zone of being impalpable and being distant and indistinct. What exactly is a mystically profound zone? We are unable to use modern concepts and language to interpret such zone. The hierarchy of immortals, the definition of the capabilities of the Yang spirit (Yang shen), etc. etc. are only for the sake of illustration. Just like “the Dao that can be described is not the eternal Dao”, what can be expressed clearly as the “non-being” among “non-beings” is not the true nature of “non-being”. From the “being” zone to the mystically profound zone is an area which can be explained within our cognitive realm. The mystically profound zone itself is already a zone which cannot be explained clearly, let alone the different positions of the different realms of divine immortals above the mystically profound zone. When a Man cultivates himself to the gate of Heaven and Earth, and attains that mysterious and amazing Yang spirit (Yang shen), without doubt, his self-cultivation techniques have gone far into the realm of mystical profoundness. To go further, the ranking of the capabilities of the Yang spirit (Yang shen), the hierarchy for the realms of the divine immortals, etc. etc. are totally acts of the human race to apply modern recognitive intelligence to make a corresponding projection of the realm of “non-being”. Perhaps on such path of mystically profound positioning, such divine immortals have different capabilities, but such distinction in capabilities is no longer important. A divine immortal is an infinite entity that can transcend reality, whether such mystical profoundness is infinite or not, and whether such divine immortal is capable or not, has no substantive meaning. Its substantive meaning is just that the capabilities of the Yang spirit (Yang shen) with respect to such mystically profound positioning is the possibility of infinite expansion (see the attached “Reversion Diagram 2”). Mystical profoundness is dialectical but it also encompasses “being” and “non-being”. All existence in the natural realm, although from their superficial appearance, can be said to have emerged in the form of “being”, but concealing behind it, all existence still have their basic property of “non-being”. This is the own tension of all existence, which may move towards the direction of “being” and thereby following nature, or which may move towards the direction of “non-being” for reverting to the original position. The bi-polar development of mystical profoundness can be attributed to the manifestation of own basic instinct and “the Dao emulates nature”. The path for becoming an immortal through reversion (ni xiu) is of course a path for self-cultivation, but it only allows a Man who has departed from nature to return to the mystically profound position which complies with nature. A Man at such stage is a human immortal (ren xian), who returns to the cradle of nature. At such mystically profound positioning, if the level of self-cultivation is further elevated, the capabilities of the Yang spirit (Yang shen) may be realized. A “Man” at this stage can be an earthly immortal, divine immortal or heavenly immortal. Mystical profoundness is nature, and reversion is a technique for pursuing such mystically profound position, a self-cultivation project for returning to nature. The condition being: we have already departed from nature. The significance of reversion is cultivation from a condition which has departed from nature to the true face of nature, which applies to the cultivation of the mind, as well as to the cultivation of the body, both allow us to revert to the mystically profound position. The evolution of life is from “non-being” to “being”, whereas reversion is from “being” to “non-being”, the path in between “being” and “non-being” is the path to mystically profound communion, which is the true face of nature, and during which, there is nothing against nature. The cultivation from a human immortal (ren xian) to other ranks of immortals is only the result of extended self-cultivation at the mystically profound position, and at such position, the capabilities manifested by the Yang spirit (Yang shen) are full of infinite possibilities. This paper was presented on November 2, 2010 at the Guangdong Daoist Culture Festival “Luofu on Dao” Conference . Source: The Scripture of Western Ascension (Xi Sheng Jing). 120 years of age is advocated by modern science. This is based on 5 times the years taken for an animal’s brain to develop to maturity, which is defined as the lifespan of an animal; it takes 25 years for a human brain to develop to maturity, i.e., the primordial life of a human being is 125 years. See Verse 25 of Lao Zi. Verse 64 of Lao Zi: “Assisting all beings in the course of nature, thereby not wanting to interfere”, which corresponds Man’s assertive (you wei) acts with Nature’s non-assertive (wu wei) acts. See Scripture on Hidden Talisman (Yinfu Jing). Verse 1 of Lao Zi: “Constantly without desire in order to observe its wonder, constantly having desire in order to observe its limitation”, from which it can be seen that Lao Zi did not look down on “having desires”, and more correctly, he pointed out that Man could apply “having desires” in order to “observe its limitation”. Lao Zi supplemented “the two come from the same origin but are given different names, both may be referred to as mystical profoundness” to “constantly without desire in order to observe its wonder, constantly having desire in order to observe its limitation”, which means “having desire” and “no desire” are the same in terms of mystical profoundness, and if explained in modern language, it means to balance the two. Lao Zi’s criticisms about having excessive desires are obvious, which can be found in many places throughout the book, for instance, Verse 46: “no calamity is greater than being discontented; no guilt is greater than wanting to possess”, to mention just a few. Whether Zhou Dunyi’s “Taiji Diagram” (Taiji Tu) was derived from Chen Tuan’s, there have always been different views. The opinion of the majority scholars is adopted here. See Zhuang Zi - Enjoyment in Untroubled Ease (Zhuang Zi-Xiao Yao You). Zhong-Lü Inner Alchemy means the inner alchemy system with Zhongli Quan, the master, and Lü Dongbin, the pupil, as the core. “Five classes of immortals” are “ghostly immortals”, “human immortals”, “earthly immortals”, “divine immortals”, “heavenly immortals”, see Anthology of the Transmission of Dao from Zhong[li Quan] to Lü [Dongbin] (Zhong-Lü Chuan Dao Ji). Complete Methods of the Numinous Treasure (Ning Bo Bi Fa) explains the functions of the earthly immortals, divine immortals and heavenly immortals, which are manifested through the capabilities of the Yang spirit (Yang shen). In a nutshell, an earthly immortal is the Yang spirit (Yang shen) lingering on a physical body, who no longer has the capability to transcend the mortal body; a divine immortal is the Yang spirit (Yang shen) being able to transcend the mortal body, who is able to get in and out of such body; the capability of the Yang spirit (Yang shen) of a heavenly immortal is the same as that of the divine immortal, only that such Yang spirit (Yang shen) does not stay on earth but dwells in heaven. Historically, the unanimous point of view on entering the realm of the divine immortals through self-cultivation is through the cultivation of the mind and the body. The “three poisons” are greed, hatred and ignorance. See Yellow Emperor’s Internal Classic-Basic Questions-Ancient Innocence Theory (Huangdi Nei Jing-Su Wen-Shang Gu Tian Zhen Lun). Make reference to the section on human immortals described in Chapters 1 to 4 of Complete Methods of the Numinous Treasure (Ning Bo Bi Fa). See Verse 42 of Lao Zi.